The Dual Liner Truck Bed Liner Is The Newest In Truck Bed Liner Technology and Protects Your Truck Bed Against Dents, Dings, and Scratches Caused By The Most Rugged Of Cargo. This Unique Multi-Piece Design Will Not Trap Water Or Dirt and Provides More Protection For Your Bed Than Your Typical Drop In, Spray On, or Roll On Bed Liners. Dual Liners Rubber Floor Is Not Only More Skid Resistant Than Drop In or Spray In Bed Liners, But Is Also Less Abrasive To Your Paint Finish Underneath. With The Dual Liner Truck bed Liner You Still Retain All Of your Factory Tie Downs and Load Dividers. 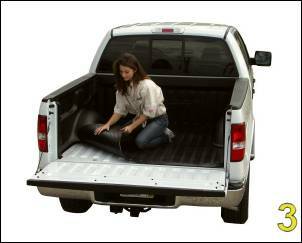 Installs Easily In Minutes and Removes Just As Fast For Easy Truck bed Cleaning.